From the depths of Asia comes the greatest of all empires, the Mongols of Genghis Khan! They are an unstoppable force; China, India, the Islamic lands and Christian Europe are all threatened or conquered already. With the mortal horde comes monsters of the night, both distant cousins of European Cainites and the dreaded Wan Kuei of the Middle Kingdom. Vampires call for blood and the world trembles. 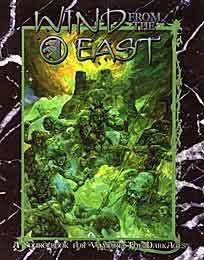 Wind from the East provides complete information on the Mongol invasions and the diverse vampires who move among Great Khans horde. This book covers the entire period of Mongol expansion into the West and reveals the rich culture that denies the image of heathen invaders. Both Cainites and Cathayans feed among the Mongols, and Wind from the East reveals their courts and conflicts.